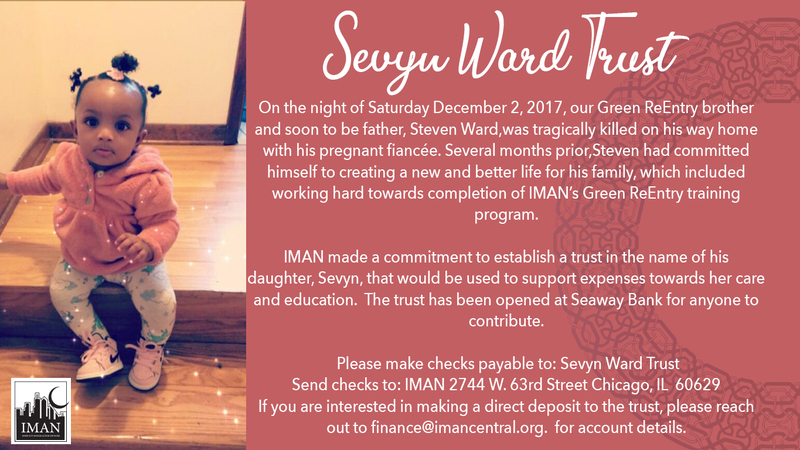 On the night of Saturday December 2, 2017, our Green ReEntry brother and soon to be father, Steven Ward, was tragically killed on his way home with his pregnant fiancée. Several months prior, Steven had committed himself to creating a new and better life for his family, which included working hard towards completion of IMAN’s Green ReEntry training program. IMAN made a commitment to establish a trust in the name of his daughter, Sevyn, that would be used to support expenses towards her care and education. The trust has been opened at Seaway Bank for anyone to contribute. You can donate online by clicking “DONATE” below or send in a donation. If you are interested in making a direct deposit to the trust, please reach out to finance@imancentral.org for account details.